Near Salzburg, Austria, the home of the real life Von Trapp family, another kind of spectacle emerged thousands of years ago. Eisriesenwelt, an ice cave literally dubbed “The World of the Ice Giants” in German, can be found beneath the Hochkogel Mountain, in Styria, about 70 kilometers from Salzburg. Fantastic stories on a miniature railroad. The amazing wonder cabinets of a very rich Austrian archbishop. Eisriesenwelt is the largest of the world’s ice caves, an unusual phenomenon created when ice forms beneath already-created lava or limestone caves underneath the ground. 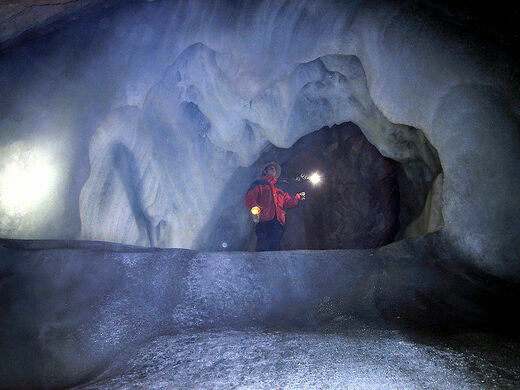 Often confused for one another, glacier caves are formed within ice, while ice caves are formed within stone structures. 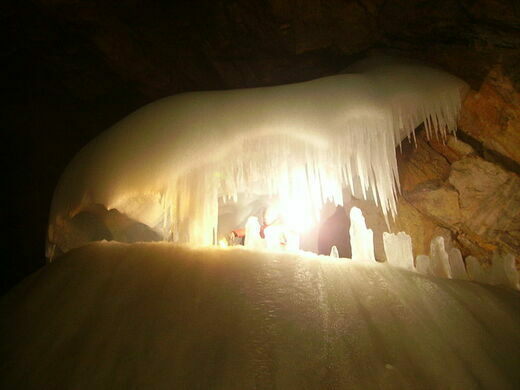 Despite its freezing temperatures, Eisriesenwelt was thought to be the entrance to hell according to Austrian lore. Because of its creepy reputation, Austrians didn’t explore the cave until Anton Posselt traversed its icy depths in 1879. The cave started gaining popularity with tourists in the 1920s, when the first paths up the mountain to the caves were built. Today, Eisriesenwelt is relatively unknown throughout the world and only hosts around 200,000 visitors each year. Even those who are able to visit the enormous cave only get to see a fraction of it—about one kilometer of the cave’s total 40 kilometers. To visit the cave, visitors take a cable car up to the Oedl Haus, a traditional mountain hut built for the first influx of visitors in the ’20s. Trains to Werfen leave from Salzburg about every hour. From the Werfen train station it's a 15 minute bus ride to Hochkogel Mountain. The bus to the Eisriesenwelt visitor center leaves about every 25 minutes from Parkplatz Gries, a short walk from the train station.